This article will present the latest research on surgery for complete or full thickness rotator cuff tears. If you have been diagnosed with a partial rotator cuff tear, please see our companion article for discussions of partial rotator cuff tear non-surgical treatments. How did you get here? You may have had your follow up surgical consultation and you are looking for another answer. Perhaps you just returned home from your follow up visit with the shoulder surgeon. He/She read the MRI findings report to you. You have a full thickness rotator cuff tear. Your orthopedist may now be recommending a rotator cuff surgery or management with non-surgical methods. Whatever recommendation you received, you are looking up more information online. So you likely got here because you are confused and concerned by surgical and non-surgical recommendations for your complete or full thickness rotator cuff tear. You may have already visited numerous websites that told you of the traditional symptoms, the traditional conservative care, and the traditional surgical options, but you may still not be getting some of the answers you are looking for. This article will present the for and against surgery for a complete/full thickness tear. In reading this article you may be surprised by the amount of research written by surgeons representing some of the world’s leading medical hospitals and research universities where they themselves expressed concerns about the effectiveness of the rotator cuff surgery and its complications. “Magnetic resonance imaging (MRI) has long been considered a perfect imaging study for evaluation of shoulder pathologies despite occasional discrepancies between MRI reports and arthroscopic findings.” Did the same thought enter your mind? If it is perfect how can there be discrepancies? In other words, the complaint about the MRI reading is that it is taking a snapshot and not providing the whole picture. How then is it perfect? You are more likely to undergo surgery if you had an MRI? MRI is the pathway to surgery. You get sent for an MRI, surgery is not far behind. In a 2017 study, Doctors at Brigham and Women’s Hospital and the University of Ottawa studied the prevalence of MRI ordering in cases of a shoulder injury. A total of 475 patients who underwent shoulder MRI were included in the study. patients who had a prior x-ray were more likely to get an MRI. If your regular doctor sent you to an MRI you were less likely to get a surgery than if the orthopedist sent you to the MRI. MRIs performed on patients with NO PAIN, show a high prevalence of tears of the rotator cuff. Questioning what a shoulder MRI says as the basis for rotator cuff surgery is not a new concept, concern reaches the mainstream in 2011. In October 2011, the NY Times reported a fascinating article featuring an interview with well-known sports surgeon James Andrews, MD. Seeing that most injured athletes and active people receive MRIs when faced with a sports injury, Dr. Andrews set out to see what MRIs showed on people with no pain or symptoms at all. He performed an MRI on 31 perfectly healthy professional baseball players. The results? 90% showed abnormal shoulder cartilage and 87% showed abnormal rotator cuff tendon (tears) despite a 0% incidence of pain. The article goes on to cite a few other well-known orthopedists who explain that MRIs are sensitive but not specific and that abnormalities are usually inconsequential. In fact, there are almost never “normal” MRIs. Unfortunately, the use of MRIs has become so common that people believe good and accurate care must involve ordering a fancy test. Many of these doctors cited agree that a proper diagnosis can be made by taking a thorough physical and historical evaluation. We do not rely much on MRI for these reasons. MRI may not offer an accurate picture. Physical examination continues to be our “gold” standard. Please note that this study next to be quoted was published in the Journal of magnetic resonance imaging, a medical journal of radiologists and surgeons. At this point we are confident that we can provide a non-surgical alternative as we will describe below. In the following studies, you will hear what concerns rotator cuff surgeons: Among their concerns? Surgery can cause more harm than good. Surgery involves the permanent alteration of the body and when it comes to the rotator cuff, the major stabilizer of the shoulder. Surgery can cause more harm than good. Recovery time is often long and presents its own complications as indicated above where physical therapy is thought to cause re-tears. It’s estimated that 10-70% of rotator cuff repairs cause repeated problems following surgery. Despite improvements in rotator cuff surgery techniques, re-tear rate remains above 20% and increases with tear severity. (The worse the tear the greater the odds it will re-tear). In a study from Germany published in Operative Orthopedics and Traumatology, doctors found the problem of re-tear and tears are affected by many factors, but, predominantly, recurrent tears are due to non-healing of the rotator cuff tendons. For many people reading this article who had many shoulder operations, the following may sound very familiar. Tear, re-tear, surgery, re-tear, surgery, re-tear, surgery, until a stage of “permanent” shoulder instability is reached. Back to the research paper we are citing. How many “successful” rotator cuff surgeries can your rotator cuff tendons take? “Different modes of failure are responsible for recurrent defects of the rotator cuff. The management of recurrent defects depends on the clinical symptoms of the patient, the objective function of the shoulder and the pathomorphological (the abnormal function of the shoulder after surgery) changes of the rotator cuff and the shoulder joint itself. Besides letting the shoulder heal on its own and/or conservative management, arthroscopic revision of failed cuff repairs appears to be a promising procedure. Irreparable tears can be managed using tendon transfer or shoulder replacement procedures (reverse prosthesis) depending on the functional symptoms of the patient. Reverse Total Shoulder Replacement recommendation? This is the standard course of treating difficult to treat rotator cuff repairs. Many times a person suffering from rotator cuff pain will suggest that their surgeon says they can use “bio-materials” stem cells or blood platelet solutions during the procedure and this will enhance healing. When we ask a patient how did this come up in conversation, they say they asked the surgeon about PRP and stem cells and were advised that they could get these treatments and the surgery too. Doctors at the Department of Orthopaedics and Traumatology, University Hospital Bern wrote this in the journal Orthopaedics & Traumatology: Surgery & Research: (Explanatory notes and comments in the parenthesis). The doctors do summarize much of what we covered above. Reasons for this rather high failure rate include compromised healing at the bone-tendon interface (enthesitis). 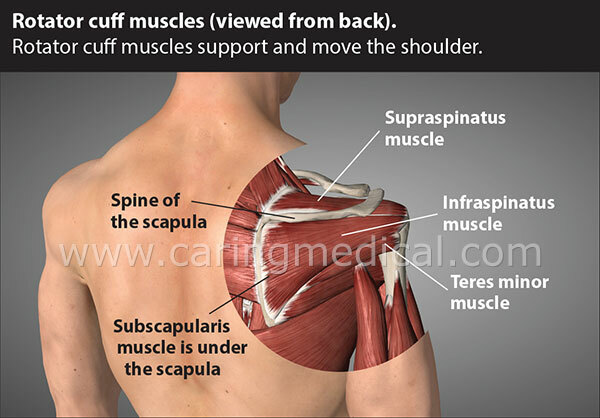 It is important to note that instead of a physiological enthesis, an abundance of scar tissue is formed, as well as the musculo-tendinous changes that occur after rotator cuff tears, namely retraction and muscle atrophy, as well as fatty infiltration. (Comment: Unyielding scar tissue forms where elastic tendon tissue should be. This will obviously lead to chronic, painful, limiting range of motion. s muscle movement in hampered, muscle atrophy occurs. Muscle is breaking down and fat is replacing atrophied muscle. Not what an athlete or someone who has a physically demanding line of work needs). Biological augmentation to improve surgical outcomes, including the application of different growth factors, platelet concentrates such as found in platelet-rich plasma), cells (various types of stem and stroma cells), scaffolds (patches) and various drugs, or a combination of the above have been studied. Rotator cuff surgery is a dramatic surgery that involves a lot of cutting of tissue in a joint that by nature is hypermobile in all directions. Healing after surgery, no matter what healing enhancements are added during the surgery, will continue to be a great challenge. Newly and most recently popularized is the introduction of dehydrated amniotic tissue membrane or “amniotic stem cells,” into a rotator cuff surgery. Learn more about amniotic stem cells and why we do not recommend them. “Tears within the tendon substance or at its insertion into the humeral head represent a considerable clinical challenge because of the hostile local environment that precludes healing. Tears often progress without intervention, and current surgical treatments are inadequate. Simply the surgery caused the formation of scar tissue where elastic and flexible tissue that allows the shoulder its vast range of motion should be. To answer to the high rate of surgical failure? “new materials and surgical techniques have been refined in an effort to augment the strength of the regenerated tissue and replicate the anatomical footprint of the rotator cuff.” Stem cells. Comment: It is difficult to get stem cells to fix the extensive damage of surgery at the time of the surgery. This is why your orthopedic surgeons tell you stem cells don’t work. For him/her, they have seen the research on the application of stem cells during surgery, it is not enough. In Stem Cell Prolotherapy we use a person’s own healing cells from bone marrow, fat, and blood (alone or in various combinations) and inject them straight to the area which has a cellular deficiency. At Caring Medical we utilize Prolotherapy as the first option. It is the among the oldest and most tried of the regenerative medicine injection techniques. A small amount of simple sugar or dextrose is injected at various tender or trigger points in the shoulder to stimulate tissue repair. Why do we use this treatment as a first option? It is inexpensive compared to PRP or stem cell injections. In the video below Prolotherapy and Platelet Rich Plasma injections are explained. In combination, we call this PRP Prolotherapy. In Platelet Rich Plasma injections your blood is used, by way of its platelets, to create concentrated platelet solutions rich is healing and regenerative factors. Stem cell therapy is reserved, in our clinics for very advanced degenerative changes in the shoulder. Treatment utilizing stem cells for rotator cuff as a first line treatment is something that we usually do not offer because of expense and the ability of Prolotherapy and PRP to do a good job of healing. We do discuss this with all patients prior to treatment. Our ultimate goal with all forms of Prolotherapy is to get the patients back to doing the things that they want to do without pain and without surgery. Which again begs the question, in certain tears why not try the PRP and stem cells as injections without the surgery? The goal of the surgery is to repair and restore function but for many patients, this is NOT achieved. Doctors are looking at Platelet Rich Plasma and stem cell injections to regrow the damaged tissue in the shoulder. An explanation – what they are saying is that patients, especially aging athletes and people who work at jobs that require strength, demand a functioning shoulder – surgery is not the answer. Doctors at the Hospital of Special Surgery in New York acknowledged that surgery did not offer what the patients wanted both pain relief and function. So slowly the wheels of medicine are changing – fortunately, biological considerations – non-surgical injection therapy designed to regenerate your shoulder can be offered at Caring Medical today. Recent research suggests Prolotherapy is an effective treatment for rotator cuff injuries, pain, and function in patients who failed to respond to conservative treatment. Studies show that arthroscopic surgical repair for partial rotator cuff tears and related injuries results in outcomes no better than treatment with exercise or physical therapy alone. Athletes favor rotator cuff surgery under the belief that that is their best way back to being active sooner – however research says that being active sooner may cause surgical failure. Arthroscopic rotator cuff tear repairs have a high percentage of re-tear risk and frequently result in side effects such as continued pain, stiffness and decreased range of motion. Surgical intervention for rotator cuff pain based on MRI’s are often misleading, as studies show the presence of MRI confirmed rotator cuff tears in individuals with absolutely no symptoms. Further compounding problems of the glenoid labrum. “Despite improved surgical techniques, the tendon-to-bone healing rate is unsatisfactory due to difficulties in restoring the delicate transitional tissue between bone and tendon.”(18) This same research from doctors in Spain also says Mesenchymal stem cell therapy is a potentially effective therapy to enhance rotator cuff healing and prevent complications. These researchers base this opinion on the fact that stem cell therapy increases the amount of fibrocartilage formation. This is the tissue that helps make up ligaments, tendons, and cartilage and are specifically marked for studies on tissue engineering. But treating the tendon interface and the shoulder ligaments is something that Prolotherapy does as well. In new research in the medical journal Orthopaedics & Traumatology, Surgery & Research, doctors tested the effectiveness of Prolotherapy in difficult chronic refractory rotator cuff tears. They were hoping to find that dextrose prolotherapy would reduce pain and improve shoulder function and patient satisfaction. In the exercise group, patients received a physiotherapy protocol three sessions weekly for 12 weeks. Both groups were instructed to carry out a home exercise program. Both the exercise group and the Prolotherapy group achieved significant improvements. Prolotherapy group had significantly better pain relief scores at weeks 3, 6, and 12, and last follow-up. Prolotherapy group had significantly better shoulder abduction and flexion at week 12 and last follow-up, and in internal rotation at last follow-up. No significant difference was found in external rotation at any follow-up period. Can we help you get back to work, sport or simply a better quality of life? Even though you have been told you have a full thickness tear? Caring Medical Regenerative Medicine Clinics have over 25 years experience is helping patients avoid surgery. Once we do an examination on the patient we give a clear picture of what he or she can expect from our treatment. Sometimes we are very optimistic that we can offer a lot of help. Sometimes some one comes into our office with a rotator cuff injury significant enough that reality says surgery. How would you know who you are? An examination usually does a great job determining that. Even if you have been told surgery is the only answer, which we addressed in the research above, we have done countless second opinions where we were able to provide the patient non-surgical options. References for Rotator Cuff Tear Surgery | Why the high failure rate?